Suffering from foot and back pain? Orthotics might be the right thing for you! Orthotics are a custom-made prescribed medical appliance that fits inside a person’s shoe. Orthotics provide extra support for your feet and body. They work o realign the feet, ankles and knees. The feet act as a foundation that we stand on. Just like how a house with a crooked foundation creates crooked walls, if the feet are out of alignment, it can have affects up the legs and into the back. Because of this, often times patients with low back pain benefit from orthotics. Orthotics are used as the insole for your shoes. They are very versatile and can be placed in protective footwear, dress shoes, running shoes, soccer cleats, skates and children’s shoes. Where you go, your orthotics go! Orthotics work best when paired with a sturdy, stable shoe. Using a poor quality shoe is like putting poor quality tires on a sports car—you compromise the performance. Look for shoes that resist twisting, folding and bending. How Can I Get Orthotics? Your local Chiropractor can fit you for Orthotics! Here at Edgar Family Chiropractic, chiropractors are trained to assess your walking patterns and posture to see if custom orthotics would be a benefit for you. Book a custom orthotics fitting at your next appointment! Have you experienced it? You wake up in the morning, take that first step and as you place pressure on your foot, pain radiates through your heel. Or maybe you’ve felt this pain after a long shift standing on your feet all day. What is this pain? One of the most common causes of heel pain is due to a little thing called Plantar Fasciitis. How do Orthotics help with Plantar Fasciitis? Custom orthotics work to realign and support the arch of the foot. In the case of flat feet, the orthotics would be placed in shoes to create and maintain an arch in the foot. This takes tension off the plantar fascia. For impact sports, orthotics support the arch of the foot to reduce the amount of stretch placed on the connective tissue. What are the benefits of Custom Orthotics Burlington? Can return to the daily activities that you love! Speak with your local Chiropractor or Podiatrist if you think that Custom Orthotics would help to improve your quality of life. Your feet are the foundation on which sits your whole body. Weight of the body is transferred down into the feet and forces that are created during activity are transferred from the feet, up the legs and pelvis and into the spine. When a misalignment of a bone in the foot occurs, the misalignment travels up the lower leg and into the spine affecting every joint along the way. In simpler terms, if the foot is not working the way it should, it will affect the overall posture of the body. For example, if one foot is flat (aka pronated), it will cause a valgus force through the knee (aka “knocked knee). The pelvis will drop down on the side of the flat foot now that the leg has “shortened.” The body, in attempt to keep upright and maintain a balanced centre of gravity will cause the spine to side bend to the opposite side. Also Read : How to Keep Your Feet Happy ? Now queue the back pain, knee pain and/or foot pain. While still functional, the body is not meant to carry weight in this warped state. How can misalignments be corrected? Since the bones of your feet are permanent structures and the sidewalks, concrete and wooden floors are non-resilient, a new walking surface will need to be created for the feet. How is this done? Using Custom Orthotics. If a custom orthotic is applied to the case from before, the orthotic would work to restore the arch back into the foot. As a result the knee and the pelvis would return to normal position and the spine would come back to neutral. With the body now structurally where it should be, it can carry weight and forces pain free. At Edgar Family Chiropractic in downtown Burlington, our chiropractor can assess your feet and recommend as well as make the appropriate custom orthotics for your feet. We are in the season when leaves begin to change from green to shades of red and orange. As we draw closer to the end of the year and begin to run out of warm days, you may notice that your insurance coverage is running out as well. Don’t miss the opportunity to order your orthotics! Orthotics can be a great help to your feet knees and back. Don’t know what Orthotics are? 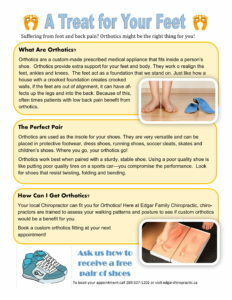 Check out our newsletter highlighting the benefits of orthotics and how to use them. Send your kids back to school with happy feet by following these helpful tips! Make sure that the shoe store offers to measure. A proper fitting shoe means less wear and tear, and more comfort for your child throughout the day. Are Custom Orthotics Right for You? Back pain is now considered a global epidemic that affects about 80% of the population. Further, Doctors are less and less willing to prescribe prescription pain medications to their patients… so what is the solution? Many people wear insoles inside their shoes either at work or for everyday activities. Make sure that your orthotics are specifically made to fit your feet and any abnormalities that might be causing you problems. Orthotics are medical devices that are placed into your existing shoes (or you can have them made specifically for a new pair of shoes). They are used to support your feet and correct any improper gait (walking) patterns we have developed. By fixing someone’s improper biomechanics in their feet/knees and hips, orthotics can be used to treat many different conditions including plantar fasciitis, Achilles tendonitis, shin splints, knee pain, low back pain, and flat feet. They can also be used to reduce fatigue for people who are standing for long periods of time on hard surfaces (construction/factory workers). Also Read: Are Custom Orthotics Right For You? So let’s say you or your doctor have decided that you would benefit from a pair of orthotics. Who should you see and how do you know they are trained to properly assess your feet and fit you for orthotics? It’s important to go to someone who has been educated to assess your posture and gait biomechanics. You have options including Chiropractors, Podiatrists, Chiropodists, Orthotists or Pedorthists. When being examined they should be assessing the movements in your feet/ankles, knees, hips, and even low back. They should assess your arch height to determine if you have low, high or normal arches. The way you walk should be assessed to determine if you roll in (pronate) or roll out (supinate). While it’s much more common to see pronators it’s important to do a full examination to determine each person’s individual need and to make sure you don’t miss anything. Once you have been assessed and your orthotics are made, they should be dispensed by the health practitioner to make sure they fit into your shoes properly and if not to make any necessary changes. The number one reason people say that their orthotics didn’t help them was because they took them out of their shoes because they were uncomfortable. Orthotics can only work to help people if they fit properly and are comfortable. Orthotics can be extremely beneficial for people and be the difference between a daily foot and lower leg pain and no pain. But it’s important to make sure what you are wearing is going to help by having a regulated health practitioner examine and correctly fit you for your pair of truly custom orthotics. Without this, you may be using orthotics or insoles that are not improving your foot function or potentially even making it worse by exaggerating improper foot/ankle biomechanics.